It was quite an experience for our most recent World Vets team! Their arrival in Panajachel was delayed a day in Antigua due to roads blocked by mudslides and other unsafe travel conditions. Luckily, the following day’s journey along the PanAmerican Highway did not encounter any new obstacles or hazzards, despite the continuing downpours. 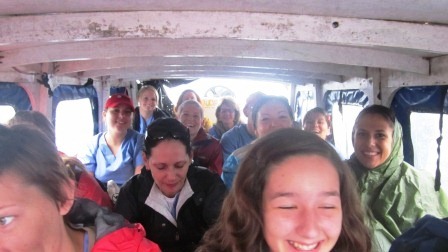 Early the next morning we loaded the team and clinic equipment into a boat and headed across Lake Atitlan to San Pedro La Laguna. Volunteer Barbara had a good line up of animals already waiting for us. We quickly got to work setting up for patients while dodging rain drops. What a great team! We were up and running in less than an hour! By mid-afternoon the rain had turned heavy again. The road in front of the facility looked like a small river. The weather had impacted our intake. But the team had already sterilized 30 animals by that time. We held tight until the rain subsided enough for our safe return across the lake in late afternoon. We hoped that conditions would allow us to safely return the next morning according to plan. However, we awoke the next day to pouring rain and a phone call from our boat captain saying that it was not safe to cross the lake. The extended tropical depressions we were having caused another change of plans! Day 2 became a “free day” for the team, and plans for Day 3 in Santa Cruz/Jaibalito were canceled. Instead, Day 3 became a return to San Pedro to finish what was started. On Day 3 the weather finally broke. Some members of the team commented that it was like they woke up in a different country than they had been in for these past days. Excited to see the sun and volcanoes, we easily made the boat trip back to San Pedro. With equipment and supplies still in place, we were back to work within minutes after our landing. An additional 38 animals received our standard complement of services that day, along with numerous consultations for ailments such as skin conditions and other diseases. As Day 3 ended and we made our return to Panajachel, our boat captain told us that the San Pedro radio station had made special acknowledgment announcements of gratitude to our team. As well as hopes of anticipation for future clinics in their village. This special event was made possible primarily through the support of the Brigitte Bardot Foundation. Ayuda is very grateful to BBF, World Vets, and the enthusiastic residents of San Pedro! Please check out our Flickr Photostream for more photos of our activities.